Use the cider vinegar and honey treatment for arthritis and also apply cider vinegar externally to painful joints. This entails drinking a glass of water with two teaspoons of cider vinegar and two teaspoons of honey three times a day. Local treatment can also be given by soaking the arthritic hand, or foot in a strong, comfortably hot solution of cider vinegar for ten minutes, two or three times a day – (a quarter of a cup of cider vinegar to one and a half cups of water). Arthritic knees can be attended to by making a poultice – soak the cloth in a mixture of cider vinegar and water, (as per above mixture) wring out and wrap it around the joint, then secure with a dry cloth to retain heat. When the wet cloth cools, it should be wrung out in the hot solution and applied afresh. Repeat several times, twice daily. It has been mentioned above how cider vinegar helps with the digestion, assimilation and elimination of food, and that it is an antiseptic to the intestines and the whole of the digestive tract. Due to it’s healing properties, diarrhoea can be controlled in a very short time, (that is unless some serious physical disorder is apparent). The treatment being, one teaspoonful of cider vinegar in a glass of water should be taken before and inbetween meals i.e. approximately six glasses during the course of the day. It should be noted, however, that diarrhoea is a natural attempt on the part of the body to eliminate some poison which is irritating the digestive tract, on no account should any drugs be taken to suppress these healing symptoms – on the other hand the cider vinegar will lessen the intensity, but will allow the natural course of elimination to take place. Take the usual dosage of cider vinegar and honey in a glassful of water three times a day, with meals. An application of well diluted cider vinegar can also be applied to the skin several times daily i.e. oneteaspoonful to half a cup of water. Under no circumstances should salt be taken, as this aggravates the eczema condition considerably. There is usually a potassium deficiency in those people suffering from eczema. The apple cider vinegar therapy together with honey is the essential ingredients here. Two teaspoons of each taken in a glassful of water, three times a day. This mixture retards the onset of tired and sore eyes which are usually apparent in later life, as it supplies them with those vital elements essential to their health and functioning. The falling out of hair is primarily due to a tissue salt deficiency, thus cider vinegar with its ‘wonder products’ will re-establish a natural balance, and supply the deficiencies where needed. Therefore, by taking the cider vinegar treatment the hair will maintain its natural growth. It will cease to fall out and grow more rapidly and thickly. This will take approximately two months, so perseverence is needed. The dosage is one teaspoonful of cider vinegar to a glass of water to be taken with or between meals. Cider vinegar can also be used externally for the treatment of dandruff, see under heading of External Treatments. There are a number of reasons why a person suffers from this common yet serious condition. As mentioned earlier, health will be maintained only if one is prepared to adjust his living and eating habits. Cider vinegar is not the cure-ail of man’s suffering, it is only one of the many means towards a healthier and happier life. In the case of High Blood Pressure, one’s eating habits must be taken stock of to ensure a speedy and effective recovery. Emphasis is on the natural, organically grown foods which are given to us in the form of fresh fruits, vegetables and honey – rather than the high protein foods which include eggs, meat, milk, cheese, nuts, beans etc. A balance must be maintained between the proteins and carbohydrates and one should definitely not over indulge on these protein and starchy foods. Wheat products should also be eliminated completely, together with salt which is very detrimental to the health, especially for those suffering from high blood pressure. The following dosage should be taken daily: two teaspoons of apple cider vinegar and honey in a glass of water – up to three to four times a day. Due to the eliminative nature of cider vinegar, the kidneys and bladder can benefit tremendously by a ‘flushing’, which they receive when the following cider vinegar therapy is undertaken: two teaspoons of cider vinegar in a glass of water six times a day. It would be beneficial to drink a couple of glasses of water in the morning, taking one teaspoonful of cider vinegar in each drink. Comfrey tea, first thing in the morning with a teaspoon of cider vinegar will also create a sufficient cleansing action. Inflammation of the kidneys, called pyelitis, in which pus cells are present in the urine, will generally clear up with the above-mentioned treatment. Chronic pains and profuse menstruation has afflicted women for centuries. The cider vinegar therapy certainly regulates and normalizes profuse bleeding. The dosage should be as normal i.e. two teaspoons of cider vinegar in a glassful of water three times a day. The diet should also be taken into consideration, as a high animal protein diet together with wheat products will cause considerable pain when the periods begin. In other words moderation should be used if one is partaking of these foods. However, meat, poultry, fish and wheat should be completely eliminated from the diet, together with the other unnatural foods of which man is so prone. A noticeable improvement will be experienced when the diet is kept to the fresh raw fruits and fresh salads, together with the apple cider vinegar therapy. Also plenty of water should be taken whilst menstruating, as this helps in a speedy elimination. Postnasal drips and watery eyes are also due to a faulty diet, here again this should be thoroughly investigated, as the body is eliminating excessive mucous caused by the wrong types of food. This is often caused by a lack of potassium in the diet too, hence the cider vinegar therapy will help considerably. The usual dosage as prescribed above should be taken three times a day before meals. Wheat should be eliminated from the diet completely and rye and corn products should be substituted, if required. Brittle, cracking, fragile and thin nails are a sign of some deficiency and faulty metabolism in the body. Cider vinegar has been known to remedy this particular complaint, with the results of healthy, strong nails. Also any white spots which were present on the nails previously will be eliminated. Dosage being: two teaspoons in a glassful of water three times a day. There have been cases where nervousness has been remedied with the cider vinegar and honey treatment. In this instance a glassful of water mixed with two teaspoons of each i.e. cider vinegar and honey to be taken three times a day. Refined flour and sugar products should be completely eliminated from the diet, together with wheat products. One should also cut down on the starch and high protein foods as much as possible and eat plenty of fresh salads and fruit. As an excessive nose bleed is caused by the blood being unable to clot as it should normally, the cider vinegar treatment will prove efficacious in this respect i.e. two teaspoons of cider vinegar in a glassful of water three times daily. In this respect the cider vinegar can be used as an inhalant. Use as per method described under the heading Headaches. The nasal passages will shortly clear after having inhaled the vapour. This treatment is very effective in removing the congestion in the sinuses, together with any inflammation which may result from this excessive accumulation of mucous. Cyril Scott mentions in his booklet on cider vinegar that the prime cause of obesity is the insufficient oxidation of the blood, he goes on to say, “Now the safe and salubrious treatment, proved over years of trial, is to be found in nothing more complicated than cider vinegar – the reason being, as already implied, that the ailment is conductive to the proper oxidation of the blood.” Two teaspoons of cider vinegar should be taken in a glassful of water on rising in the morning. To obtain the best results possible this should be taken before each meal and during the day over a period of some time. Natural methods always take longer to work, as the body has to adapt itself, especially the skin in this instance, as if too much weight is lost in a short period of time, then it will hang and look unsightly. The drink should be sipped during the course of the meal which will also prevent overeating and it will promote digestion. According to some authorities, the average weight reduction is 1.5 Ibs. a week. This all depends upon whether the diet has been adjusted. Salt should be discontinued immediately as this harmful commodity retains water – herbal beverages such as comfrey should take the place of tea and coffee. Wholesome, nutritious and MODERATION is the key to weightless, together with deep breathing and physical exercise. 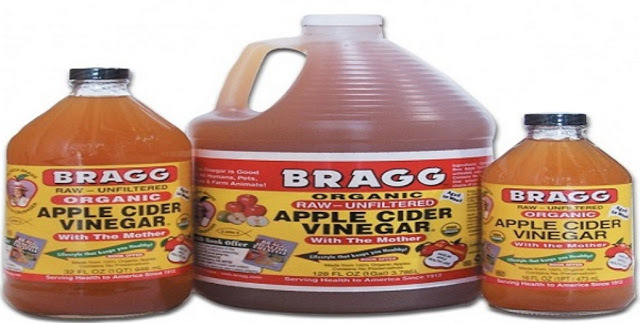 Cider vinegar relieves the pain arising from shingles if applied, undiluted, six times daily to the area of distress. It also promotes the healing. Take internally as well as prescribed above. To treat this, one should gargle with apple cider vinegar. One teaspoonful of vinegar in a glass of water is the dosage to be used. A mouthful of this solution is gargled every hour, and the second mouthful after gargling should be swollowed. This is to be repeated every hour until the condition of the throat is improved. Due to cider vinegar improving the calcium metabolism of the body, it is excellent for improving the condition of the teeth. Tartar deposits can also be eradicated by using the cider vinegar as a mouthwash and by brushing your teeth with it to enhance the whiteness. For the mouthwash, one teaspoonful of cider vinegar should be added to a glassful of water – repeat this procedure each night until the required results are achieved. This habit, together with the drinking of cider vinegar will prevent tooth decay quite considerably. The mouthwash can also be used for sore gums, or ulcerated gums – be sure that the solution is not too strong in this case, as it will slightly sting an open sore. Apply undiluted cider vinegar to the area where the veins are affected. This should be undertaken in the morning and evening. Massage well – always directed towards the heart e.g. as in the case of the legs, start from the ankles and move in upward strokes towards the thigh. Cider vinegar and honey should also be taken three times a day, i.e. two teaspoons of cider vinegar and two of honey mixed with a glassful of water. As cider vinegar supplies those organs of the body which are deficient in some mineral and normalizes the functioning of these organs, those who are underweight will find that cider vinegar will help in normalizing their weight. In this instance the following dosage should be adhered to: two teaspoons of cider vinegar and two of honey in a glass of water three times a day. (Also see Obesity) Cider vinegar will gradually decrease the weight of the body, as it tends to make the body burn up the fat instead of storing it. Some people have had results by just taking the cider vinegar without adjusting their eating habits. However, it is recommended that one should concentrate on the LIVE FOODS, rather than continue to live on the devitalized diet which is so prevalent today. The cider vinegar method, as mentioned under Obesity should be utilized three times daily. The skin is a very important part of the body, as it is the major organ of elimination. Besides being an effective eliminator the skin also absorbs substances into the body. In view of this fact it is very important to understand that we should be very careful with what we place on the skin. Unnatural substances such as cosmetics, which contain chemicals are very detrimental to the skin health. This is also true for the commercial soap we use for washing the body. The skin needs an acid mantle to maintain its lustre and glow – however, due to the extreme alkalinity of soap reacting on the skin, this causes a number of disorders. Soap also contains animal fats and hormones, synthetic perfumes and preservatives; therefore, it should not be used to cleanse the body. Instead of using soap, add a half pint of apple cider vinegar to the water and remain submerged in the water for at least fifteen minutes so that the skin surface of the body may have a chance to absorb some of the acid water. This is extremely important for those people who have an alkaline skin; this condition will be indicated by those people who continually suffer from skin irritation, and they are forever scratching their skin. Take one teaspoonful of apple cider vinegar mixed with a glassful of water – dip your comb into the solution and comb the hair thoroughly until saturated. This should be performed fifteen minutes or so before actually washing the hair. This treatment also helps with the elimination of dandruff.